On 22nd May last week, a huge gathering in Thoothukudi marked 100 days of intense protests against the copper smelting plant of Vedanta Group, Sterlite Copper. On 22nd May last week, a huge gathering in Thoothukudi marked 100 days of intense protests against the copper smelting plant of Vedanta Group, Sterlite Copper. The protesters demanding closure of the plant were shot at by the police: At least 12 protesters were killed in the firing, another succumbed to injuries the next day. The city was reeling under a curfew as people were still trying to ascertain the number of dead. In the images that streamed in of the police firing on unarmed protesters, a police sniper standing atop a vehicle and taking aim has been circulating, perhaps for the cold, calculated brutality it reflects. Its similarity with images of Israeli snipers shooting Palestinian protesters has been raised in the media. However, the connections between what happened in Thoothukudi and Israel go beyond the imagery. The Ministry of Home Affairs, for the last few years, has been investing in police training programmes with Israel. In February 2014, an agreement was signed on Cooperation on Homeland Security, following which a Joint Steering Committee was set up. This committee first met in Israel in September in 2014 and set up working groups on border management, internal security and public safety, police modernization and capacity building for combating crime, crime prevention and cyber crime. 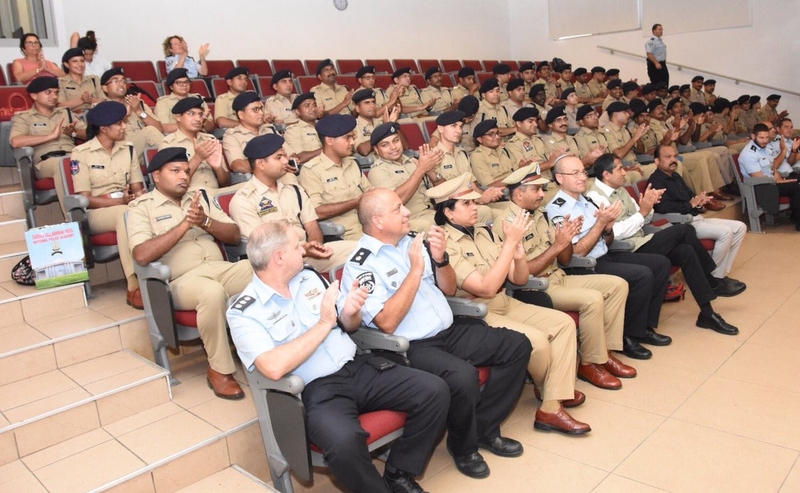 Indian Police Services officer trainees drawn from all states in India from the National Police Academy, Hyderabad have been visiting the Israel National Police Academy every year for a one-week long foreign exposure training. As part of this ‘exposure’, the trainees are taken around to show how the so-called ‘Israel border police’ operates. What the Indian IPS trainees are being exposed to, then, is the very core of Israeli illegal occupation and apartheid. More than operating on the ‘borders’ which Israel has never actually clarified, this militarised police force is known to be the most brutal corps deployed inside the Palestinian occupied territories. Palestinians are made to pass through checkpoints, searched, harassed, humiliated, interrogated and violated. To pass through a checkpoint, Palestinians need IDs, which are also issued by Israel. The ID cards, based on a national population registry run by Hewlett&Packard Enterprise technology, segregate and repress Palestinians on a daily basis. These trainees are also taken to Jerusalem, which is at the heart of Israel’s colonial project. While east Jerusalem is internationally recognized as occupied by Israel, Jerusalem itself is under international sovereignty. Israel is aggressively ethnically cleansing Palestinian communities from Jerusalem. This process of forced expulsion and human rights violations is really what Indian IPS trainees are being shown a demonstration of, when they are taken to Jerusalem. On ‘exposure tours’ within present-day Israel, trainees may instead see how those Palestinians that Israel recognizes as ‘citizens’ are in fact third-class citizens, denied fundamental rights and suffering routinely racial profiling and police aggression. Home Minister Rajnath Singh paid a visit to Israel months after the BJP-led government got elected and was said to be ‘impressed’ by the fencing system around the occupied and besieged Gaza Strip. This is where Israeli snipers have killed over 100 protesters, injured thousands, as they were marching to claim their right of return to their homes from where they have been expelled in the mass ethnic cleansing 70 years ago that transformed the majority of the Palestinian people into refugees. These fences are now being placed along the Indo-Pak Line of Control. Indian already imports 50% of Israel’s weapon exports. These weapons are openly sold as ‘combat-tested’, i.e they are developed in the repression and daily killing of Palestinians. Joint ventures between Israeli and Indian companies are now producing weapons especially for police and paramilitary usage. We must bear in mind that when Israel participates in training of police officers, when it supplies weapons and enters into other forms of security cooperation, it is also importing its methodology and ideology of repression. Suspicion of civilian population, heavy militarization of everyday life, a permanent state of war against the population - these are the foundational operating principles of Israel. When we participate in this militaristic ideology, we push ourselves towards becoming a society that is at war with its own people, always. Police brutality is not a new phenomenon in India, but its entrenchment through co-operations with Israel are a path we must avoid. Israel has joint programs of security cooperation, similar to the programme with Indian IPS officers, with other states as well. In the US, where police brutality against minorities, especially young black men, is a core issue for movements, ‘Deadly Exchange’, a nationwide campaign against joint training programmes with Israel is gaining first victories. Recently in Durham, North Carolina, the city council voted to end police exchanges with Israel. In Brazil, where targeted police violence against the poor and people of colour in the favelas is wide spread, co-operations with Israel exist in weapons trade and training. Israeli trainers are on record congratulating Brazilian police for using the same system Israel uses against the Palestinian people. Rio de Janeiro’s favela movements have now joined hands with Palestine solidarity to demand an immediate end to such training. We need to move in a similar direction. The growing ties between Israel and India are rooted in ideological motivations wherein the BJP’s Hindutva finds a home in Israel’s exclusivist, supremacist Zionist ideology, and we need to take account of the enormity of police and defence exchanges between India and Israel. These exchanges finance and endorse Israel’s illegal occupation, apartheid and colonization of Palestinian people. When Israel is hailed as a model and its police and military practices are a made part of the training of Indian police officers, the flagrant human rights violations against Palestinians are justified and legitimized. Simultaneously, these ties import the methodology of repression and brutality that we saw on display in Thoothukudi. An effective struggle against such forms of state violence and impunity must also demand ending ties of police and security cooperation with Israel.